In response to the stunning amount of unexploded ordnance in Libya, the United States ($3 million) (State Department) and the United Kingdom (£600,000) (Department for International Development) have contributed additional funds to support demining and explosive ordnance disposal efforts. First: thank you, US State Department and UK Department for International Development for providing this necessary funding. Second, how do these contributions fit into the general trend of mine action funding? According to a recent report, government belt-tightening has affected funding for UNICEF and for impoverished children and other vulnerable groups around the world (The Guardian). Will austerity impact mine action funding as well? Globally, the funding for mine action appears to have peaked in 2007 and has since slowly tapered off with a precipitous drop in 2011 (UN Financial Tracking Service). The Figure below shows mine action funding from 2001 to 2011 for all donor countries. Since the Second Review Conference of the Mine Ban Treaty in Cartegena, Colombia in 2009, we may be witnessing the effects of “donor fatigue” in mine action funding; what IRIN News called the “Landmine Hangover” (IRIN News). Because of the high cost of demining – one estimate for demining over the next decade is $2.78 billion globally (IRIN News) – and the fact that mine action funding is made on an annual, rather than multi-year basis, donors are approached every year for increasing sums of money to pay for mine action activities. With a global recession and economic breakdown, governments are enacting austerity measures leaving bilateral donors with less money to contribute to mine action and what money is made available in one year is not guaranteed for future years. Donor fatigue will compound this effect as donor countries will seek to prioritize short term returns on development funding over the long term investment that mine action represents. 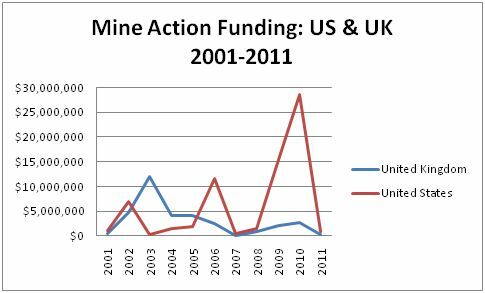 For the United States and the United Kingdom, mine action funding appears to be following two different trends: the United States appears to be increasing its funding over the course of the past decade, bucking the idea of donor fatigue, while the UK’s funding has diminished from a peak in 2003, almost perfectly conforming to a trend predicted by onset of donor fatigue. 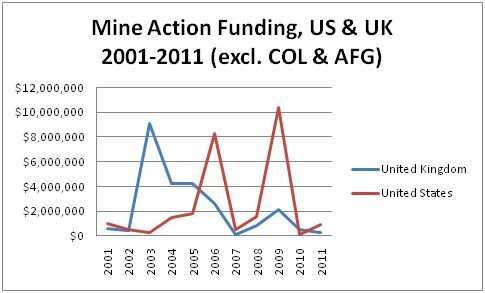 However, if we exclude Colombia and Afghanistan from the analysis, the decline in mine action funding from the United States and the United Kingdom is much more dramatic and both countries appear to be on a donor fatigue trend, although donor fatigue set in much later in the United States. Mine action funding from the United Kingdom has been in steady decline since 2003 with the exception of a minor increase in 2009 which was probably related to the Review Conference in Cartegena. The United States’s mine action funding increased over the same period, but has fallen off the table after the 2009 Review Conference. Therefore, the recent pledges for mine action funding in Libya probably represent only a small, short term increase in mine action funding from these two key donor states. As fiscal austerity measures continue in both the US Congress and UK Parliament, we can expect to see mine action funding remaining a low priority for the foreseeable future and the high levels of funding in 2003 from the UK and 2009 from the US will likely not be seen again. Michael P. Moore, September 30, 2011. The Monitor does not use the UN Financial Tracking Service as a source for its reports. 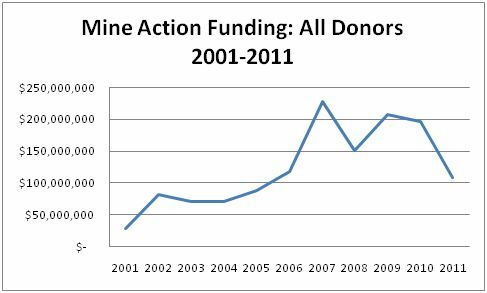 Information from donors to the Monitor on their 2006-2009 contributions to mine action has led us to conclude mine action funding has been stable rather than trending downwards. The 2010 report based on 2009 data is available at http://www.the-monitor.org/index.php/publications/display?url=lm/2010/es/Support_for_Mine_Action.html. Also, there are online profiles of each donor and recipient including five year summaries. The 2011 Monitor summary of funding in 2010 will be available online on 23 November. Thanks for this. Yes, I should always fact-check with the Monitor before going to press. Thanks for letting me know that the Monitor does not use the UN Financial Tracking Service, I will be more wary of it in the future.